Update: Richard Land has issued an apology for the remarks referenced in this post. 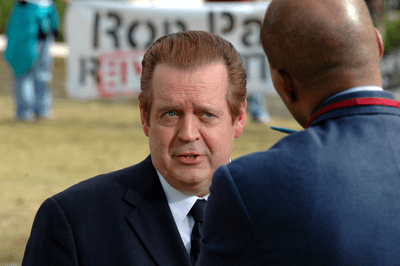 Southern Baptist leader Richard Land says he is the victim of a media mugging. First the Nashville Tennessean characterized Land’s incendiary comments on his own radio show as a “rant”. Now a Baylor-based blogger claims that the Baptist ethicist’s rant was plagiarized. Many of the words that he uttered during his radio show were taken VERBATIM – yes, WORD-FOR-WORD – from a Washington Times column penned by conservative commentator Jeffrey Kuhner. Kuhner’s column titled “Obama foments racial division” was published on March 29. Land has apologized for failing to give proper attribution, but continues to lash out at the liberal media. This brief excerpt from an article in the Nashville Tennessean will tell you what the Southern Baptist spokesman is so upset about. Some consider statements made Saturday by the convention’s top policy representative on his national radio show a setback. On Richard Land Live!,Land accused black religious leaders — whom he called “race hustlers” — and President Barack Obama of using the shooting death of an African-American teen in Florida for election-year gains. “This will be vetted in court, not in a mob mentality that’s been juiced up by Al Sharpton, who is a provocateur and a racial ambulance chaser of the first order, and aided and abetted by Jesse Jackson,” Land said on the show. The Rev. Maxie Miller, a Florida Baptist Convention expert in African-American church planting, was incredulous when he heard about the comments. No doubt they do. That’s just the problem. Land is slowly sinking into the fault line between black and white Baptists in the South. Most white Southern Baptists vote Republican and, like Land, are highly suspicious of America’s first black president. Forty years ago, Southern Baptists passed vague resolutions favoring racial harmony, but little of that goodwill filtered down to the congregational level. The Southern Baptist Convention, as a practical matter, stood foursquare for segregation and the Southern way of life. Although that stance has become an anochronism, commitment to racial reconciliation remains weak. Black Baptists who ignore America’s racial history are embraced and sometimes celebrated. The SBC is poised to elect its first African American president in a couple of months. But there’s a quid pro quo at work here. Just as Black Southern Baptist leaders are expected to play down the injustice of the past, white Baptist leaders must eschew inflammatory, racially-tinged rhetoric. Land is being condemned by black Baptists because he failed to hold up his end. While the number of black Southern Baptists has tripled since the 1995 apology for slavery, it should be noted that few black churches in the South give their primary allegiance to the white-dominated SBC. Most are dually alligned with the (black) National Baptist Convention or some other historically black Baptist group. Richard Land thinks Jim Crow segregation was a bad idea. He thinks Abraham Lincoln, the Great Emancipator, was America’s greatest president. But you can’t take potshots at Barack Obama, you can’t castigate prominent black preachers like Al Sharpton and Jesse Jackson, and you certainly can’t reinforce the curse of racial profiling and expect black Baptists to remain silent. Land wants to stay on good terms with his denomination’s small but growing African American constituency; but his primary role in the SBC is nurturing the hand-in-glove relationship between the SBC and the social conservative wing of the Republican Party. The Trayvon Martin case made it impossible for Dr. Land to keep Baptists on both sides of the race line happy. When the story became too big to ignore, he revealed his true feelings. Immediately, his standing with white Southern Baptists soared, while black Baptists recoiled in horror. If Southern Baptists want informed, thoughful commentary on the significance of the Trayvon Martin story, they should ask black Baptist clergy to comment. Unfortunately, even politically, socially and theologically conservative black leaders know too much to toe the party line on racial justice. I am a white Southern Baptist who has often found problems with Richard Land. I have tried a couple of times to contact him, but got no reply. I heard his “Rant” above and was disgusted. In the past I was angered when he catagoized all un-employed as lazy, cigarett smoking, beer drinking leeches who are ruining America. He said that they should be ashamed to be accepting unemployment and that they wold get up and get a job if the money was stopped and they ran out of cigarets and beer. He seems to be just another big bussiness Republican who equates that with being a Christian.